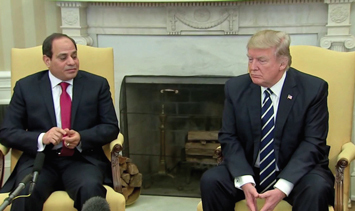 Egyptian military leader turned president, Abdel Fattah el-Sissi, recently did a 60 Minutes interview, which if nothing else, exposes Africa’s history of Western-backed despots and brutal dictatorial leaders claiming democratic governments. And, the fact that el-Sissi will soon be handed the chairmanship of Africa’s continental body, the African Union, speaks volumes to what continues to plague much of the Motherland. Can you see what’s occurring? Right before the Egyptian president takes the reins of the AU it’s revealed, with the whole world watching, that on his orders over 800 peaceful protestors were massacred and over 60,000 have been arrested. To make matters worse, it’s also revealed that his ambassador unsuccessfully tried to prevent airing of the interview where this all came to light. Then, after it airs on American TV, it comes out that the el-Sissi administration did everything in its power to guarantee the interview does not, at least in Egypt, see the light of day. Why autocrats fail to understand that trying to prevent access to information only increases interest in that information and demonstrates that they are in fact an autocrat is anyone’s guess. You don’t have to go far for a comparison of President el-Sissi taking over the reins of the AU from Rwandan President Paul Kagame. Just go to the former reality TV star turned president, Donald Trump and his taking over the reins of the American government after the scandal free administration of Barrack Obama. Let me say, no government leader is without faults, but Kagame’s success in taking Rwanda from the abyss of a genocide to a prosperous nation has bolstered his stature and that of his country. In the two years he served as chairperson of the AU reforms committee and nearly one year as chairperson, according to published reports, Mr. Kagame has pretty much succeeded in changing the management of the continent’s affairs. His successes include spearheading the launch and initial signature process of the African Continental Free Trade Area agreement, which eight countries have ratified. Rwanda was the first country to sign and ratify the Protocol on the Free Movement of People. In addition, he oversaw the launch of the Single African Air Transport Market. All of these represent big steps toward African integration. On the other hand the el- Sissi election to the chairmanship exposes the ranks of some of its members “who have profoundly patriarchal and conservative values, questionable legitimacy and blood-splattered pasts,” wrotes Tafi Mhaka, a Johannesburg-based social and political commentator in an opinion piece in Al Jazeera. Jehia Hamed, who served as minister of investment during the democratically elected government of President Mohamed Morsi, who el-Sissi overthrew in a coup, said President el-Sissi “attempting to prevent the interview from airing was an act of desperation.” “It was also driven by a profound delusion. Under Sissi’s suffocating regime, there is no free press in Egypt, just as there is no expression of opinion in art or literature,” he said. “The increasingly arbitrary war his government has waged on all perceived dissenters and ‘enemies of the state’ has produced a national atmosphere that resembles an ‘open-air prison.’ But the paranoid and bullying tactics he has employed in Egypt do not work on U.S. broadcasters. Sissi has been too used to getting his way, so absolute is his grip on Egypt,” he wrote in the Washington Post. During the interview, Scott Pelley asked el-Sissi directly about the high numbers of prisoners of conscience in Egypt’s prisons, el- Sissi denied that they existed. “Mr. President, the organization Human Rights Watch says that there are 60,000 political prisoners that you’re holding today as we sit here,” Pelley pressed. “I don’t know where they got that figure. I said there are no political prisoners in Egypt. Whenever there is a minority trying to impose their extremist ideology, we have to intervene, regardless of their numbers,” the perspiring el-Sissi said, referring to members of deposed President Mohamed Morsi’s Muslim Brotherhood party, which he has designated a terrorist organization. Interviewed for the same ‘60 Minutes’ episode was Andrew Miller, a national security official who served under the Obama administration. He claimed el-Sissi’s regime was the most repressive in modern Egyptian history. “Since Sissi took office, living standards have declined. The country is crumbling. The insurgency problem in the Sinai has only gotten worse. … And you’ve seen the mass incarceration of peaceful activists alongside hardened jihadists, which threatens to turn more Egyptians to terrorism. That seems to be a recipe for the very instability that Sissi claims he’s preventing,” Miller said. The African Union has been “disconcertingly silent,” about Egypt’s human rights abuses, which was said in June after el- Sissi became AU chairman elect. The fact that the ‘60 Minutes’ interview has opened up a global conversation concerning, not only Egypt’s human rights violations, but that those human violations don’t prevent one from chairing the continental body where much of Africa is putting its hopes and aspirations in is problematic.